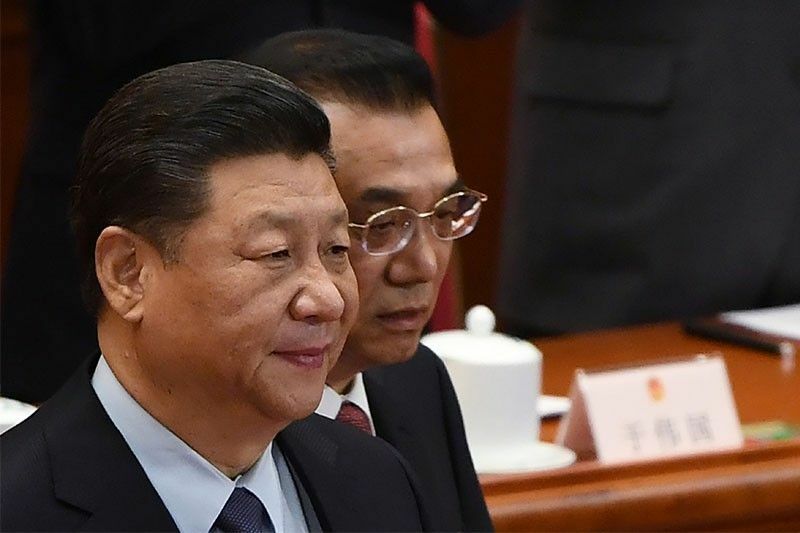 China's President Xi Jinping (L) and Premier Li Keqiang arrive for the closing session of the National People's Congress (NPC) in Beijing's Great Hall of the People on March 15, 2019. MANILA, Philippines (Updated 5:19p.m.) — As Manila withdraws from the International Criminal Court, former Philippine government officials have lodged a complaint against Chinese President Xi Jinping for Beijing's massive island-building activities in the South China Sea. Former Foreign Affairs Secretary Albert del Rosario and former Ombudsman Conchita Carpio Morales submitted a communication to ICC prosecutor Fatou Bensouda on behalf of Filipino fishermen "persecuted and injured" by Chinese officials. "The situation presented is both unique and relevant in that it presents one of the most massive, near permanent and devastating destruction of the environment in humanity's history, which has not only adversely affected and injured myriad groups of vulnerable fishermen, but prsent and future generations of people across nations," the complaint read. Del Rosario and Morales stressed that Beijing's activities in the contested waterway undermine food and energy security of coastal states in the South China Sea, which includes the Philippines. The two former Philippine officials pointed out that this is under the jurisdiction of the ICC as the Rome Statute states that "the most serious crimes of concern to the international community as a whole must not go unpunished and their effective prosecution must be ensured." China is not a state party to the Rome Statute. In the complaint, which is technically called a communication, Del Rosario and Morales said it is only the ICC that can exact accountability on behalf of the Filipino people for China's "atrocious actions" in the South China Sea, particularly within Philippine territory. Del Rosario and Morales urged the ICC to conduct a preliminary examination to "apprise itself of Chinese crimes committed not only against the Filipino people, but also against people of other nations, which crimes are already known to the international community." The complaint was submitted to the international court on a few days before the Philippines' withdrawal from the Rome Statute took effect last March 17. Under the Rome Statute establishing the ICC, the court still has jurisdiction over crimes committed during the period that the Philippines was a member, which was from Nov. 1, 2011 to March 17, 2019. "The Court can exercise its jurisdiction over these crimes, even after the effectivity of the Philippines' withdrawal, and we respectfully reserve our right to supplement this Communication with additional evidence that may come to light or arise in the future," the communication read. Del Rosario, who was secretary of Foreign Affairs from 2011 to 2016, led the Philippines in filing an arbitration against China's expansive claims over the South China Sea before The Hague-based Permanent Court of Arbitration. The United Nations-backed tribunal ruled in favor of the Philippines in July 2016, invalidating Beijing's nine-dash-line claim over the South China Sea. The former DFA chief has been repeatedly calling on the Philippine government to file a complaint against Beijing's aggression in the South China Sea, part of which is the West Philippine Sea. In the past year, China had installed anti-cruise ship missiles, surface-to-air missile system and electronic jamming equipment on its military outposts in the Spratly Islands, which the Philippines also claims. Just recently, Kalayaan Mayor Roberto del Mundo revealed that the increased presence of Chinese coast guard, naval and fishing vessels in the West Philippine Sea have been affecting the activities of Filipino fishermen. The Chinese have reportedly been denying access to Filipino fishermen near the sandbars of Pag-asa Island, one of the largest features in the Spratlys. Pag-asa Island is under the jurisdiction of the municipality of Kalayaan in Palawan province.